During his lifetime, Feynman became one of the best-known scientists in the world. His 1942 thesis applied the principle of stationary action to problems of quantum mechanics, inspired by a desire to quantize the Wheeler–Feynman absorber theory of electrodynamics. This laid the groundwork for the "path integral" approach and Feynman diagrams. 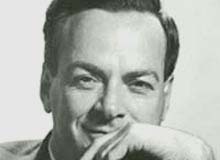 For his contributions to the development of quantum electrodynamics, Feynman, jointly with Julian Schwinger and Sin-Itiro Tomonaga, received the Nobel Prize in Physics in 1965.